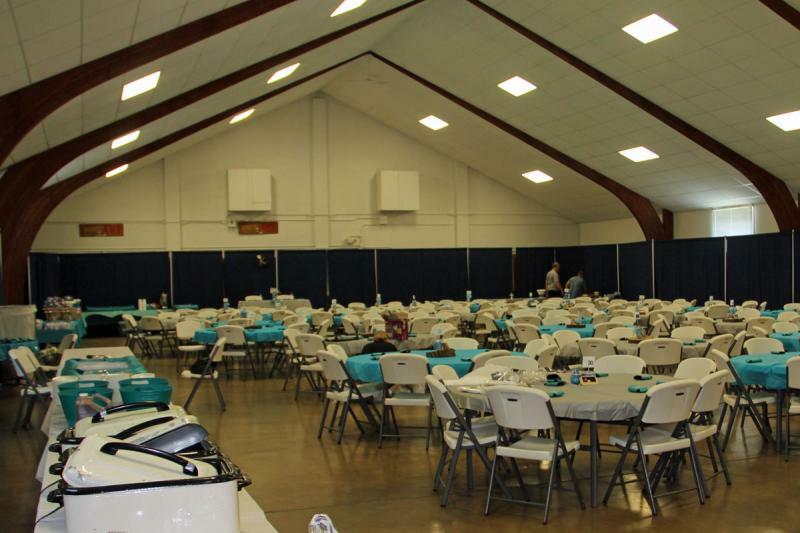 The Parke Couinty Fairgrounds is available for rental. 32 Round tables/chairs (8) $10.00 per set if removed from fairgrounds. All rental fees are due before a key will be issued. A Certificate of Insurance is required when renting a building on the fairgrounds. Liability requirements are $1,000,000 listing the Parke County Fair Board and the Parke County Commissioners as the additional insured. This is due in the Extension Office before you pick up a key. Deposits are refundable if no damages, or if cancelled at least 10 days prior to event!! Refundable deposits will be mailed within 10 days after your event is held. If “no show”, deposits are non-refundable! If there are damages to buildings or grounds, deposits are non-refundable! $470.00 Includes 2 days – one set-up day and one sale day includes kitchen. $940.00 Includes 4 days – 2 set-up days and two sale days, includes kitchen. $360.00 Includes 2 days – one set-up day and one sale day NO KITCHEN Kitchen will be locked. Any additional days will be $180.00 per day. Wedding receptions, banquets, and non-youth oriented programs will be allowed to serve alcoholic beverages only if a licensed caterer serves the beverages and agrees to accept responsibility for ensuring adherence to all federal, state, and local laws. A caterer is not an individual that works as a bartender or has a server’s license. The caterer’s name and address must be on the application and alcohol must be served in conjunction with food. There will be an additional $500 deposit (on top of the existing building rental deposit) when alcoholic beverages are going to be served. The $500 alcohol deposit is due on or before the key is picked up. Any damage or excessive cleaning will result in the forfeiture of both deposits and additional charges if needed. An off-duty Indiana Police Officer must be hired through the Parke County Sheriff’s Department for the duration of the event. Scheduling an off-duty Police Officer will be handled by contacting Sheriff Justin Cole or Chief Deputy Jason Frazier at 765-569-5413. The rate for the Officer will by $30 an hour with a minimum charge of $100. No smoking is allowed in any of our rental buildings at any time. All events must be concluded by 12 midnight. The state of Indiana has recently allowed beer and wine to be served at one time events if a “Temporary beer/wine permit” is filled out and filed with the local excise office. Liquor cannot be served with this permit and it cannot be in conjunction with any youth activities. The fairgrounds must have a copy of this permit and it can only be used during the temporary function. All servers must be licensed. Permit applications can be obtained online at the Indiana Alcohol Tobacco Commission site. Building - $125.00 plus $75.00 if heat or a/c is used. $200.00 Includes 2 days, any additional set up days will be $75.00 per day. $275.00 deposit must be cleaned up within 1 week.